Online reviews and public customer feedback have a major impact on consumers’ purchase decisions. They happen to play an increasingly important role in local search, too. Looking to leverage reviews and feedback to drive your brand’s local search ranking and performance? Here are key insights and best practices to help you get started. According to a local SEO report by Moz, online reviews are one of the top seven factors influencing where and how a business appears in local search results. The number of reviews that your brand or organization has, the speed at which these reviews are generated, your numerical ratings, the diversity of sites where you have reviews, even the authority of the people who write your reviews: these are all ranking factors across local pack and organic results. Relevance is how well your business listing or your branded content matches what people are searching for. Complete, detailed, and up-to-date business information improves your relevance and helps match your listing and content to relevant local searches. 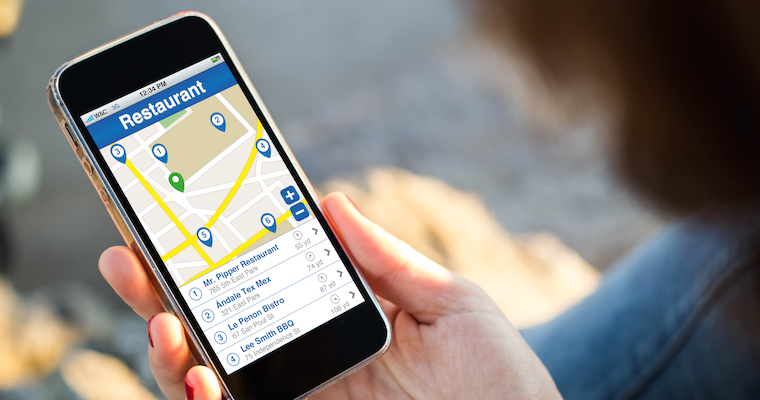 Distance refers to the proximity of your business listing’s indicated location and/or service area on Google to the location term used in a Google search query. The location term is the user’s location, determined based on location information about the device they used for searching. Prominence refers to the offline and online prominence of your business. “Some places are more prominent in the offline world,” reads the Google help article, “For example, famous museums, landmark hotels, or well-known store brands.” Online prominence, meanwhile, is based on the kind of information available on the web about your business. This includes the quantity and quality of your online reviews, as well as online scores and ratings. The first step is to get your brand or organization on Google. This means creating or claiming your business listing using Google My Business. There will be other sites where your business gets reviewed or rated: Yelp, TripAdvisor, Facebook, Citysearch, Foursquare, what-have-you. But if improving your local search ranking is your priority, a Google My Business account is a must. Local search results on Google come in a few different shapes and sizes. 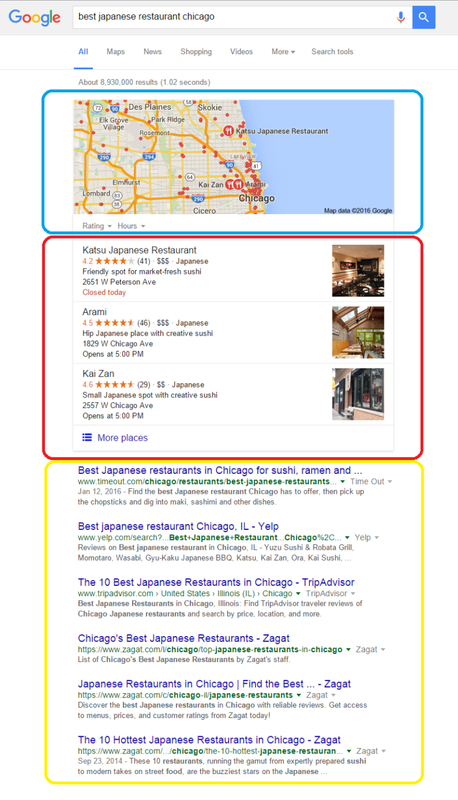 Say, if you search for the “best Japanese restaurant (in) Chicago,” you’ll see a set of Maps-based results, the “local pack” (since reduced from 7 to 3 listings), and the localized organic results (usually in that order). Once you have planted your flag on Google, do the same on online review sites. Yelp, TripAdvisor, Citysearch, and Facebook are the recommended places to start with, but make sure you also establish your brand presence on industry-specific review sites and feedback channels, like Zomato (for restaurants), Cars.com, DealerRater (for automotive businesses), and Vitals and Healthgrades (for doctors and healthcare providers). 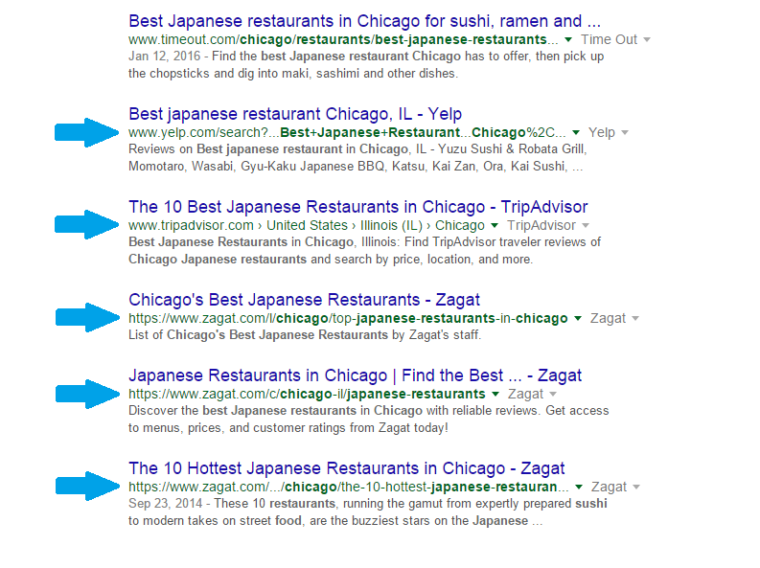 Look closely at the results for the “best Japanese restaurant in Chicago.” See those organic results just below the local 3-pack? What isn’t on Page 1 is a list of results sourced from a brand website — or, in this case, the website of any of those Japanese restaurants. This isn’t to point out certain limitations of on-site optimization or domain authority; it’s to offer a glimpse into how much value and trust search engines place on specific review and ratings websites, at least as far as local, non-branded search queries are concerned. Simply put, in local search, brands and organizations that perform well on online review sites have an edge over those that don’t. So, create or claim your business listing on all relevant sites. Your presence on these digital properties lets Google know that your business is an active participant in the local search community it has built. When you’re claiming all those listings, always provide correct, consistent, up-to-date business information. You can’t get your local signals wrong. Hundreds of SEO experts have written particularly about the importance of NAP (name, address, phone number) consistency. But not all businesses are actually paying attention. 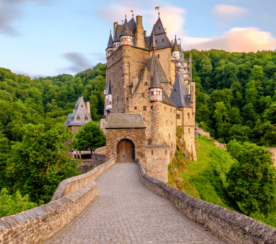 In the US, 37 percent of companies have at least one incorrect or missing name on their listings. 43 percent have at least one incorrect or missing address. And 18 percent are missing their phone numbers. The estimated cost of wrong local data is $10.3 billion in potential annual sales. 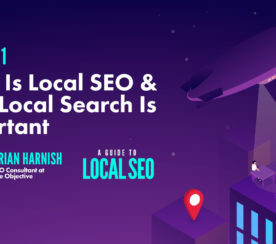 This isn’t to mention the effect it has on local search: if your business information across the Web appears unstable or inconsistent, search engines are less likely to reward you with a high-ranking in local search results. Online reviews count as dynamic content that can boost your SEO efforts: 800 words of review text, say, can make up as much as 70 percent of fresh content for your page. Product page visitors who read and interact with online reviews convert at a 58 percent higher rate than those who don’t. Shoppers who read and interact with product reviews reflect an increase of 62 percent in revenue per visit. The average order value increases to 3 percent when shoppers engage with reviews. Reviews also encourage user interaction and boost shopper confidence: important components of any successful SEO strategy. That’s why it makes sense to add customer reviews to your website pages. The beauty sector in the US, for example, has already embraced this tactic, with 83 percent of beauty brand websites now incorporating reviews as a regular feature of their pages. It’s not even necessary for you to spend hours every week manually copying and pasting reviews. You can simply use a widget. Some review websites — TripAdvisor and Yelp, among others — offer widgets or badges that enable you to display your latest reviews and ratings from those sources on your website. Some will say there’s actually little SEO value in social media marketing. 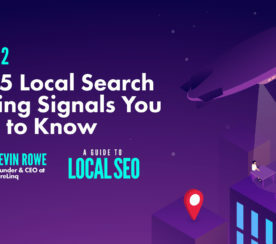 The above-mentioned Moz report even describes social signals as having less impact on local search than reviews. This doesn’t mean you should stop updating your Facebook or Twitter. After all, it won’t hurt your bottom line to have an active social media presence and a community of engaged fans and followers. Just don’t treat social as another billboard where you shove your products and services in people’s faces. They’ll be more inclined to click on a link if the content seems trustworthy. Customer reviews happen to play a major role in fostering trust. According to Forrester, reviews are viewed by consumers as more trustworthy than organic search engine results and promotional posts on social media. 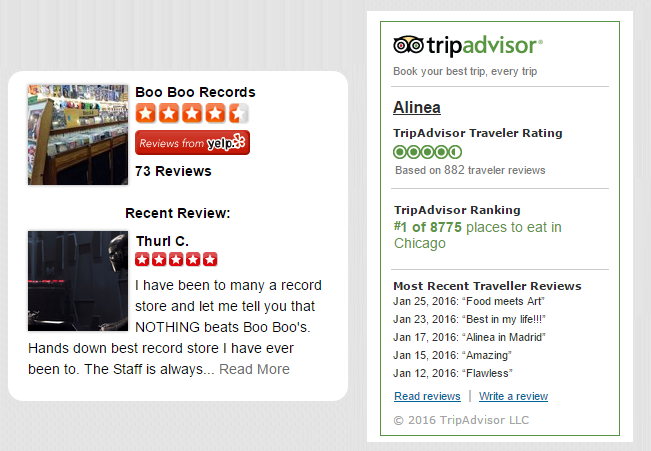 Got a new 5-star review on Yelp, Google, or TripAdvisor? Don’t hesitate to share it. Post a link to the review on Facebook or Twitter. Or grab a screenshot and upload it to Instagram. 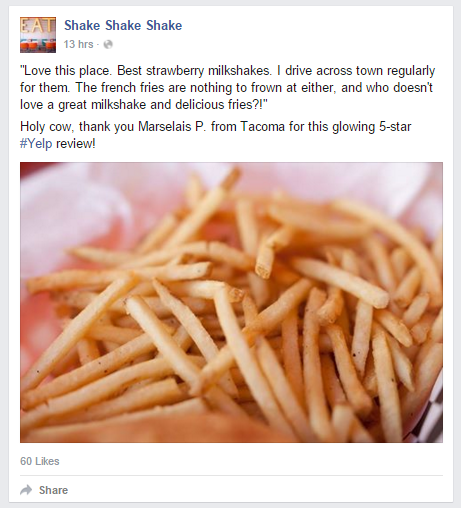 Online reviews can also be analyzed in ways that allow you to refine your SEO strategy. Bigger companies that receive a lot of feedback, for example, utilize text analytics and sentiment analysis tools to mine their review and feedback data and achieve a more complete and accurate picture of the customer experience. 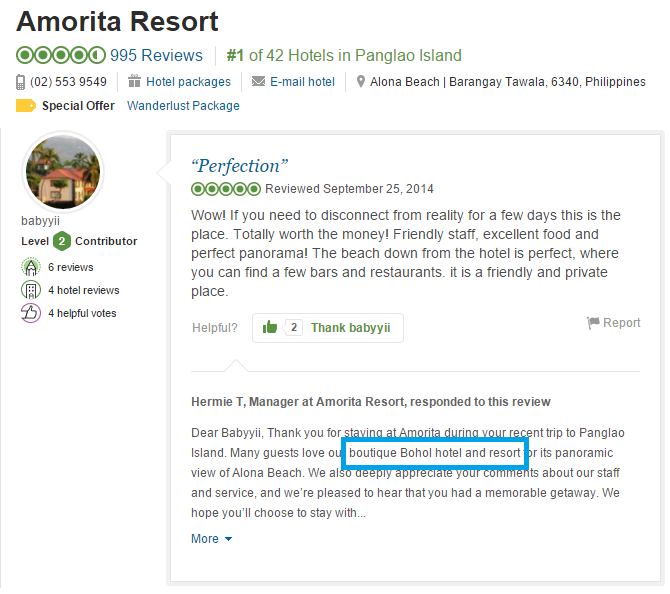 Reviews can also be particularly useful in researching keywords. Here’s a great example: fashion brands used to insist on calling hoodies “hooded sweatshirts.” But trends showed that shoppers preferred to type “hoodies” — either when they were searching online or writing a review of a hoodie they had already bought. If you’re one such fashion brand, it makes sense to switch to “hoodies” in your product descriptions and catalogs, right? With a simple adjustment, you can improve your search relevance and ranking. Responding to reviews lets customers know you’re listening to their feedback. It’s also a neat trick for creating fresh content that’s typically crawled by search engines — not to mention, a fantastic engagement driver. According to TripAdvisor research, businesses that respond to reviews enjoy 17 percent higher engagement and are 21 percent more likely to receive booking inquiries. So, while rankings are cool, qualified leads and improved conversion rates are cooler. You don’t have to respond publicly to every single review, but when you do respond, be nice. Address the customer’s concerns. If the review was full of praise, say thank you. 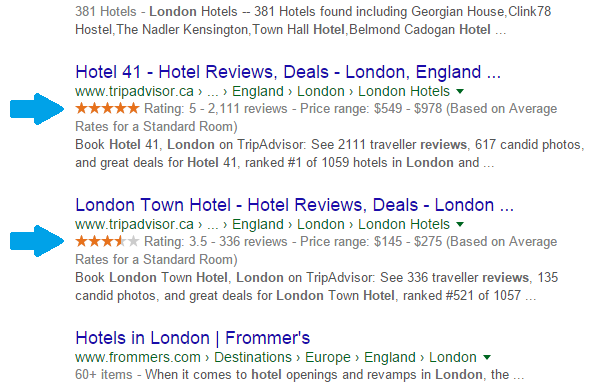 Given the impact of reviews on local search, it’s important to have a strategy for acquiring or generating new reviews. This can be an e-mail or social media campaign, a customer feedback survey, or an awareness blitz telling people to find and rate you on Google or TripAdvisor. Build review quantity, velocity, and diversity (studies show that improvement in these areas correlates with better rankings and higher CTR). It’s important to know when you should and shouldn’t be aggressive in your efforts to generate customer reviews. First of all, don’t fake your reviews and give yourself five stars. As search engines evolve and become more sophisticated, they’ll get better at weeding out the fakes. It’s not worth gaming the system. Thirdly, implement a system that helps you identify who among your customers are happy — and who aren’t. You don’t want to usher in a wave of one-star reviews that could destroy your reputation. The Net Promoter Score (NPS), for example, offers a proven methodology for grouping people according to how willing they are — on a scale of 0 to 10 — to recommend your business, with 0 being likely and 10 being extremely likely. If you’re able to tap into your NPS data, you can filter your review generation efforts and reach out only to those who are likely to post positive reviews and feedback. So there would be no “Review us on Google” messages that end up in the hands of dissatisfied customers. Search engines love online reviews for the simple reason that consumers trust, actively look for, and depend on what their fellow consumers think. It’s fair to assume that Google has assigned increasing value on reviews because that’s what its users look for and click on. And while search tactics will continue to evolve and vary, they will always be grounded in a simple notion: speak the language of your customers and it will do wonders for your search performance and bottom line. All screenshots by Chris Campbell. Taken May 2016.